I decided to make a couple more blocks for this month’s lotto. They are the 2 blocks in the bottom row. Terri, I went ahead and deleted your original blog post with the first three blocks, like you mentioned on the forum. I hope that was OK. Your blocks look great. I love that appliqué heart. 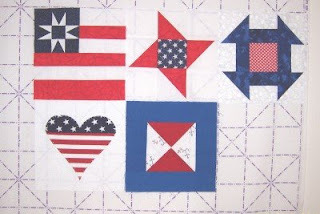 Terri, I agree with Sophie; the applique heart is beautiful as are all the blocks.